Moon Lake is a very special and interesting place for me and my family. I think there is a lot more history to be uncovered there than we know of. Below are a few interesting things in that area that we have explored. Looking down on Moon Lake from near the base of the cliffs. Ice CaveOn a recent fishing trip we went looking for an Ice cave that a friend of mine told me about several years ago. This trip we were able to locate it and get a few pictures inside. It is partially collapsed about 25 ft back, but the tunnel is nearly 350' long. It is not a cave but was created as a test tunnel for a routing of the pipes to the flume. It was abandoned and used as a storage place for the dam workers food. You can see the shelves they used on the left half of the tunnel.The ice in the mouth of the tunnel usually remains until the late part of August. Below is a shot of the flume pipes underneath the dam. This tunnel is 400' long and is in remarkable condition for being built in the 1930's. The pump chamber (photo below). Directly above this room is where a sink hole occurs as shown in Dale Bascoms' book. The sink hole has been thought to have been a mine at one time but is really just an occurrence from the construction of the pump room. Left to right; Cameron Coles, Spencer Coles and Kent Coles. This old cabin is near to the Moon Lake dam, and was used by the dam builders to store their explosives. I have not been able to find out if the cabin was already there or if they built it. Not much is left of this old Spanish Mine. After discovery it was decided to open the shaft using a bulldozer to expose the vein. But within little time the original shaft was completely caved in. Shortly thereafter Mr. Bullock passed away and the operation was canceled. Several other attempts were made to reopen the shaft, but all have been unsuccessful. Lost Rhoades Gold Mine Discovered Recently By Bullock Mines - Metals Discovery of the lost Rhoades Gold Mine west of Moon Lake in Duchesne County, Utah, was announced this week by Mr. Ben H. Bullock of the Bullock Mine, Metals and Oil Corporations of Utah.Mr. 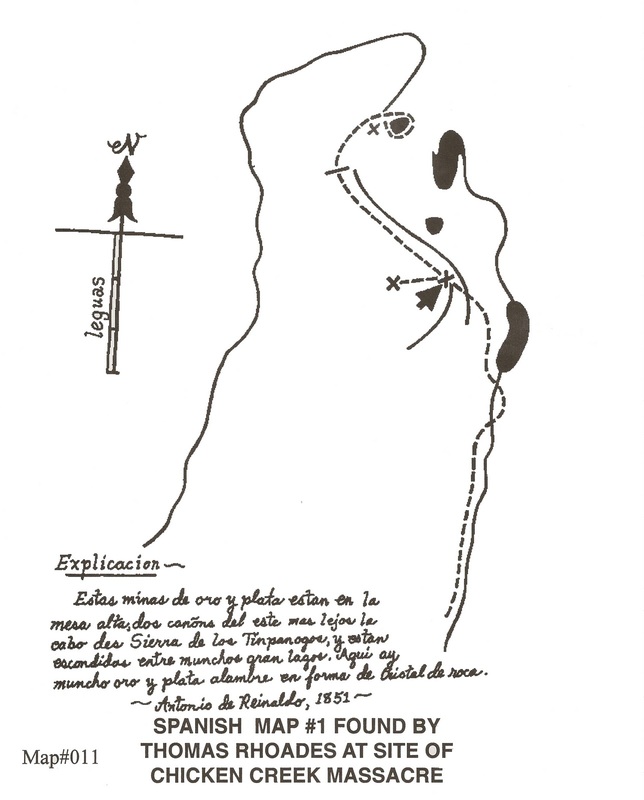 Bullock stated that the mine was located by instrument test and through use of an old buckskin map drawn by Caleb Rhoades. The map is owned by Mrs. Mary Steele of Goshen, Utah. The mine was discovered by Mr. Bullock and his son, Vein Bullock, 100 W. 960 N., Provo. 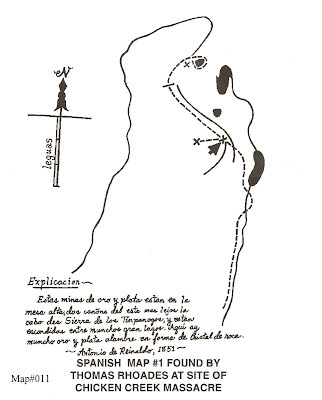 In an interview with Mr. Bullock, he stated that the mine was originally discovered by Indians living in that area. 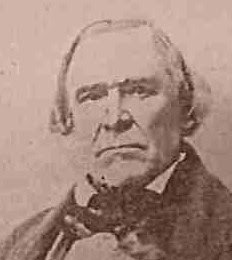 "Caleb Rhoades," he continued, "was liaison between the Benjamin Hart Bullock-farmer and miner. Born Oct. 27, 1878. Son of Benjamin Kimball Bullock, one-time mayor of Provo, Utah. (Utah State Historical Society)Indians and Brigham Young who was believed to have used the gold to mint money used by the settlers in the Salt Lake Valley. 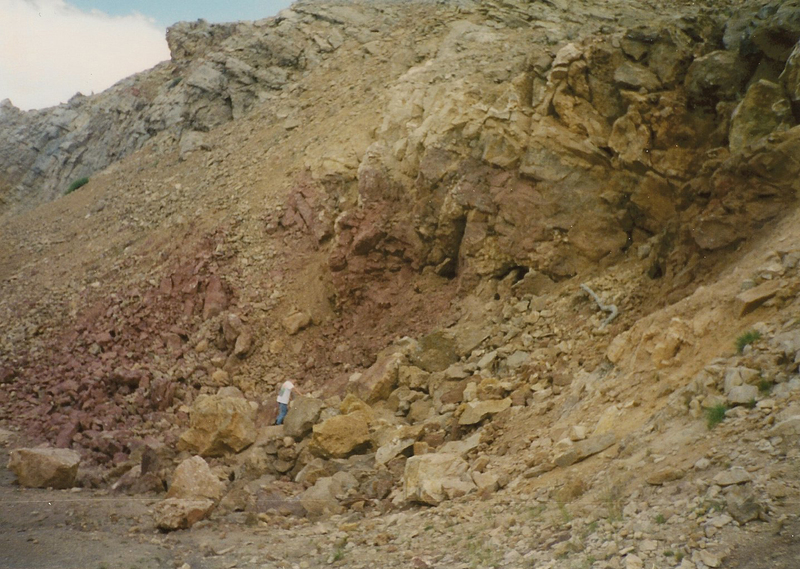 "The gold vein," said Mr. Bullock, "is 600 feet in width by 2,000 feet in length in a contact vein between porphyry and quartzite. Operation of the mine will begin soon," he continued. 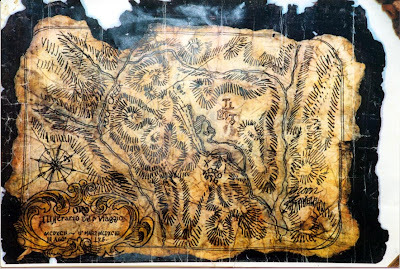 The map below was published in Gale's book "Lost Gold of the Uintah" and was supposedly one of the maps that Thomas Rhoades found at the site of the Chicken Creek Massacre. Another story is told in George Thompsons book "Faded Footprints of the same area. "Stan Brennan, a gray-bearded Mountain Man type, has spent a lot of time at Bear Wallow. About four miles north of Mountain Sheep Pass, Brennan discovered a place where there are many old Spanish signs cut into large and obviously very old trees. By following those signs he came to an old log cabin. In the pine forest close to that rotted old cabin he found the remains of a corral, so dilapidated that it was hardly recognizable. That corral and cabin are not very far away from the 1856 Pine Mine. 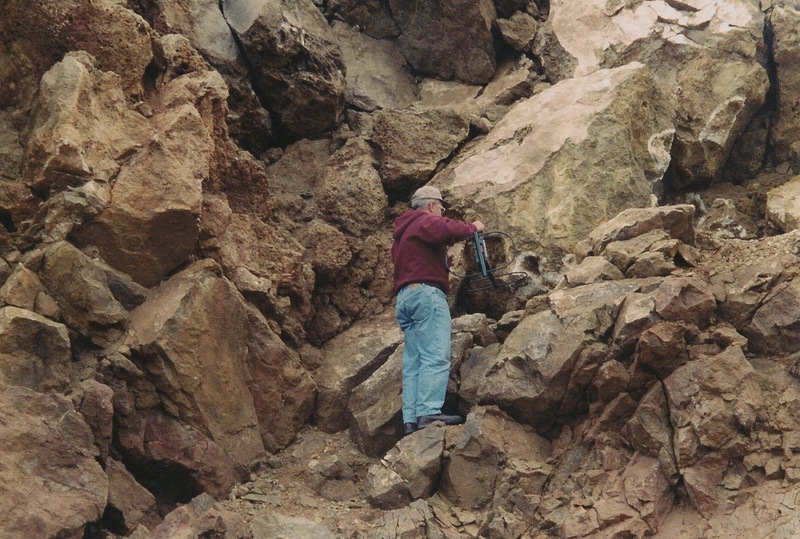 Wayne Nelson also found that old corral many years ago, but at that time there were still some old-fashioned leather ore sacks there, what Spanish miners called "zurrons" or "cueros." According to Nelson, the Jeep road through Bear Wallow and to the 1856 Pine Mine and Monument Knoll beyond was built by Les and Dan Pope. Cecil Dalton had been working an old diggings near there and he told the Popes about his claim. When Dalton returned several weeks later he found the Popes in possession of his diggings. Angry words erupted into a brief shoot-out, with gun shots being exchanged by both parties, but with no one being hit or injured. This mine was discovered in the 1930's by Clarence Mecham from information given him of an Old Indian. The family worked for years in cleaning out and exploring the old shaft, but still has not uncovered the original vein worked. The owner of this mine is up there every year, and continues the work still to this day. 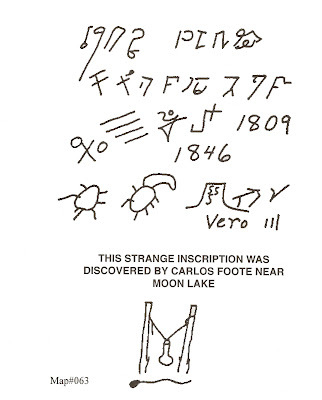 This was discovered by Carlos Foote near Moon Lake. The language is unknown. 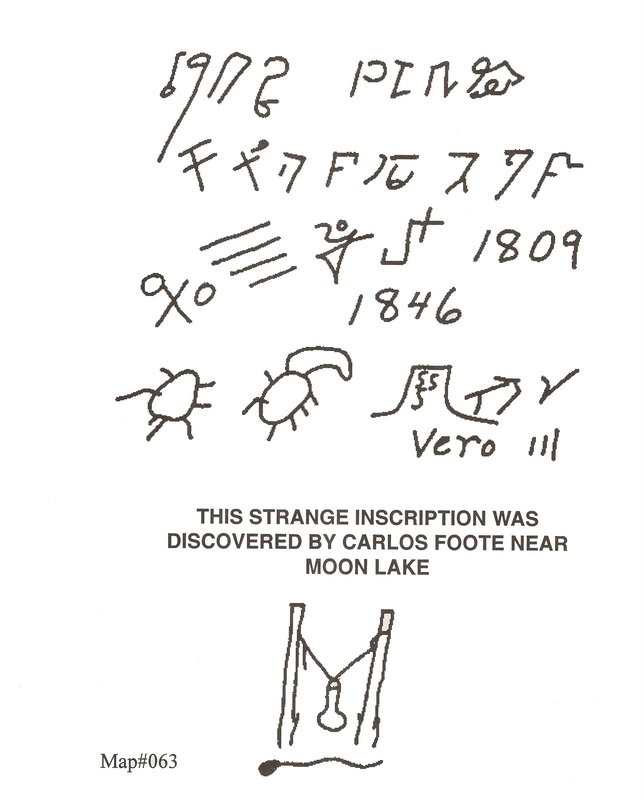 Gale Rhoadses recounts this story on page 65 of his book "Lost Gold of the Uintah". “I knowed Old Cale Rhoades for lots of years. Back in '78 him and me and Pardon Dodds chased some renegade Utes from old Colorow's band all the way from Kamas Valley to where Whiterocks is today before we lost them. We traveled through some chest deep snow all the way to Vernal - it was called Ashley then. That's when Cale Rhoades told us where one of his famous mines was; or, at least, pretty near did. We stopped in the timber way up near Moon Lake, just on the crest of this ridge, and Cale said, ‘You guys wait for me, I'll be only afew minutes’. Sure 'nuff, in about five minutes - maybe ten at the most - he came back packing a buckskin sack full of pure gold ore. He told us, ‘This will sure pay our expenses’. Says I, ‘Yeh, but don't worry about us coming back and locating your gold mine?’ ‘Hell no’, says he, ‘you've been riding circles around it all day and you could ride right over it and never see it!"